We had a funeral yesterday. The deceased, a loyal and trusted friend, died suddenly and unexpectedly. I was particularly fond of the old devil. A good friend of mine gave me that recip saw. All ratty and beat up, it looked as though it had been mauled by a bear. "You need one of these and are too stubborn to buy one for yourself," he said. "So I am giving this old thing to you. Maybe you can get a year or two out of it before it dies." We had that conversation over fifteen years ago. And all I can say is boy was he right. He and I cut an entire wall out of a house I owned in Portland with that thing. Slipped a brand new patio door in the hole just as slick as you please. I've cut tree limbs, heck, I've cut entire trees down with it. I've cut all kinds of pipe. I cut open an in ground oil tank at that same house so the tank could be decommissioned. Cut that tank from stem to stern, quarter inch steel, cut right through it like butter. There were countless other times over the years that I offered up a prayer of gratitude to him while I used that saw to slash through something or another. I was cutting out another palm stump when it finally gave up the ghost yesterday afternoon. The third palm stump in two weeks. 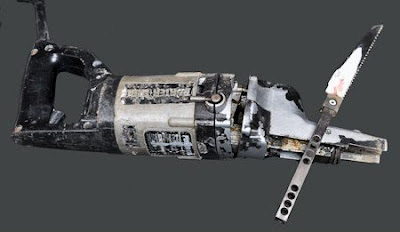 A good demolition blade chews those out actually better than a chain saw. Takes about two blades per stump. Was chewing the stump out like gangbusters, when suddenly the blade shaft completely ejected from the saw amidst horrible grinding noises. 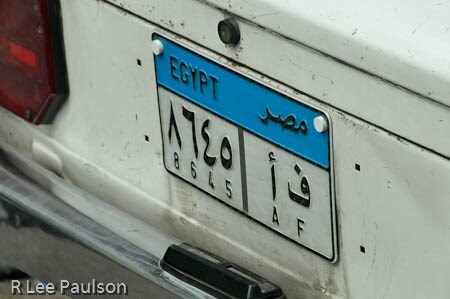 Notice the roman numbers below the Arabic ones. That allowed us to learn our Arabic numbers while we were there. We made a game of it. This and the photos that follow will allow you to get an idea of how the game works. She did really well getting these photos in some of the most chaotic traffic I have ever seen. Sadly, she missed the Arabic seven and zero. In one of my obvious oversights, I forgot to get a close up of the entrance that they are now using. The big gash in the side above the people is the original entrance. If one looks closely one can see the line of people queuing up on the left, working their way up about 6 courses of blocks or so. Those were the folks who waited patiently in line for us to leave so they could enter. The actual entrance is just to the right of them and down a course or two. It's the pointy black hole with the guy in green just to the left it. It is much smaller than the original, which is now screened over. 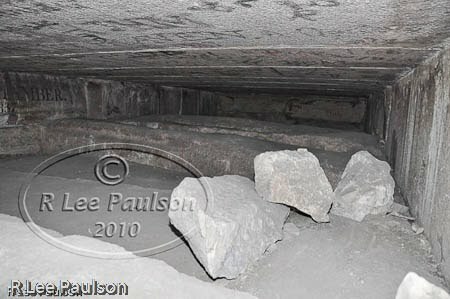 I exited the Queen's Chamber and headed down the small tunnel back towards the entrance. 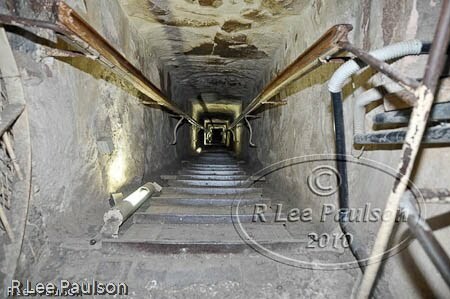 This tunnel and the next one into the subterranean chamber were challenging for me, to say least. I am so tall and all legs so that, bent over the way one must be to navigate these short tunnels, my knees almost literally hit my chin. The others, being quite a bit shorter than me, were able to stand more upright and walk close to normally. I was forced to duck walk using only my ankles and knees. I have now made my way up to the 4th chamber above the King's Chamber. This is called Lady Aybuthnot's Chamber. I have no idea who Lady Aybuthnot was or why Vyse named this chamber after her. 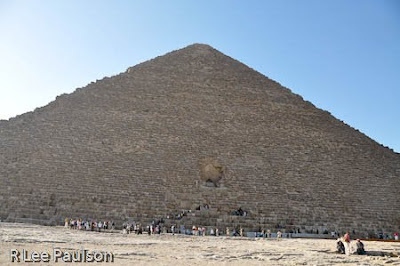 We boarded our van at o' dark hundred the next morning and drove from our hotel to the Giza plateau, where, at precisely 0600, just as the first slivers of light were breaking over the horizon, we were ushered inside the great pyramid. The gates closed behind us and we had the place all to ourselves. I apologize in advance for the large, ugly watermarks in these images. But, as I am making these posts available to places unknown, I needed better protection for them besides my name at the bottom. 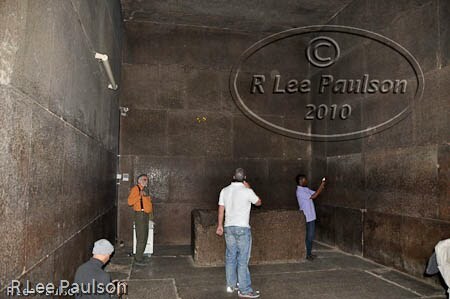 Usually no photographs--a rule that is strictly enforced-- are allowed inside the Great Pyramid. Here we are in the king's chamber. The holy of holies, if you will. I'm standing by the back wall near the entrance, which is off to our right. Notice the size of the blocks used to construct the walls. This is all red granite that had to be quarried up in Aswan, which we've seen, and ferried 300 or so miles down the Nile. There are, as one can see, five courses of stone, 100 blocks in all. 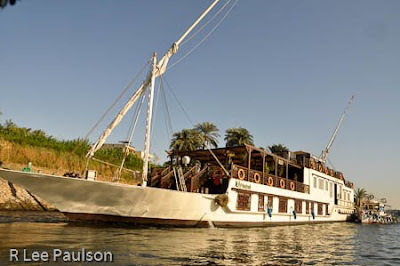 Aswan is a picturesque little town in upper, that is southern, Egypt. Our hotel, situated on an island in the middle of the Nile, was one of the nicest hotels I have ever stayed in. West's Egyptian tour company wanted to charge us $350 for a side trip to Abu Simbel from Aswan--by bus. 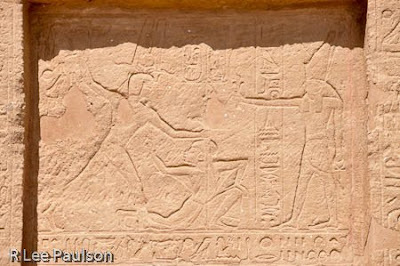 Abu Simbel is 150 miles south of Aswan. Getting there by bus is trial because the Egyptian government insists on convoys in order to protect the tourists. One convoy leaves at 7am, the other at 1pm. Up to 50 tour buses in each convoy descend on the small Abu Simbel temple at the same time. West refused to go because of the 3 hour bus ride each way and the resulting pandemonium once we got there. I believe this is the outside hallway that looks out upon the water, the outside of which we saw in the second photo of the last post. The proportions in this place were absolutely lovely. Grand and intimate at the same time, a hard balance to find. 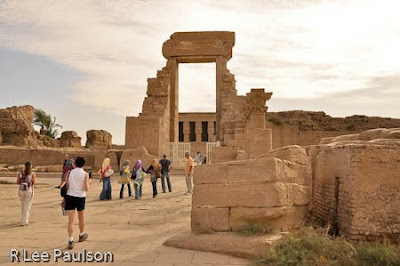 Philae is a wonderful little temple located on an island in the Nile behind the Aswan dam. 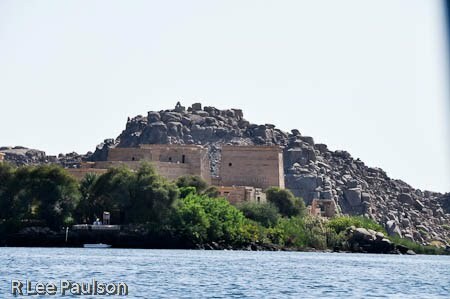 We arrived in Aswan, 179 miles south of Luxor, around noon and drove directly to the granite quarry there. This quarry has been in constant operation for thousands of years. 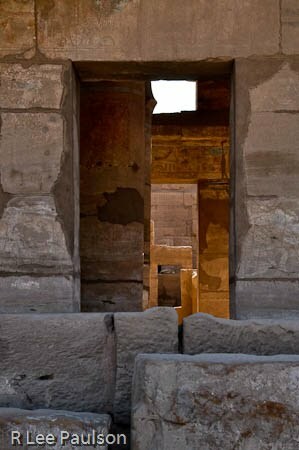 Of course, attempting to understand ancient Egyptian symbolism is a lot like looking through this doorway. Ambiguity abounds. 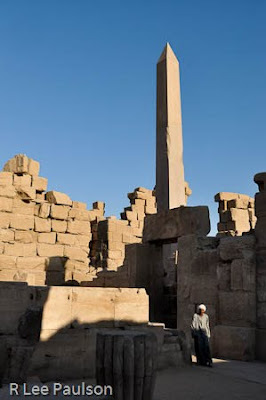 If we consider again the statue of Amun being ceremonially moved from this temple to the 'Temple of Man', for example, other possibilities reveal themselves besides the simple symbolism of spirit descending into matter. 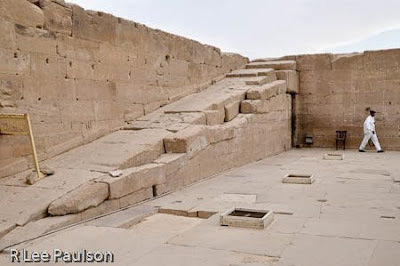 Another view of Hatshepsut's obelisk. Notice all the different sized blocks in this small courtyard. One imagines they were from different building periods, but one can't be sure. We arrived at Karnak temple just as the sun rose over the city when the temple opened. We did this in order to get the place mostly to ourselves. The plan worked well, except for one loud, noisy, tour bus full of revelers who apparently had the same idea. After Hatshepsut's temple, we made our way over to the Valley of the Kings and looked at three royal tombs. Sadly, no photos were allowed at all in The Valley. Cameras were not even allowed past the guarded entrance. Not only were the guards strict about this rule, but they sternly turned down the baksheesh we offered them. 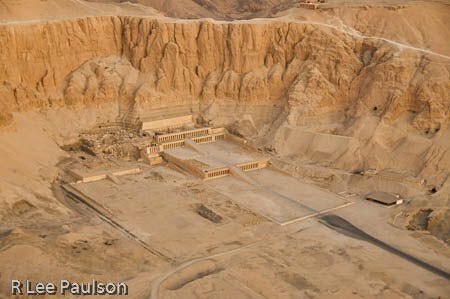 We got back from The Valley of the Kings just before sundown. 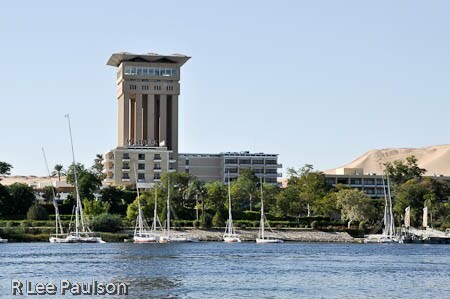 Notice the cruise ships all tied together behind the sailboats. They are locked in together like bricks in a wall. I'll show a clearer shot of this type of stacking later. 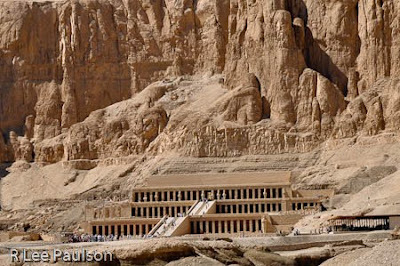 West says, "The mortuary temple built by Queen Hatseepsut is called in Egyptian, 'The Most Splendid of All.'" Notice the ruins of an older temple, smaller but of similar design on the left. Also notice the covered bazaar on the right. From here, one cannot tell by looking that there is a huge forecourt between the first staircase and the second. 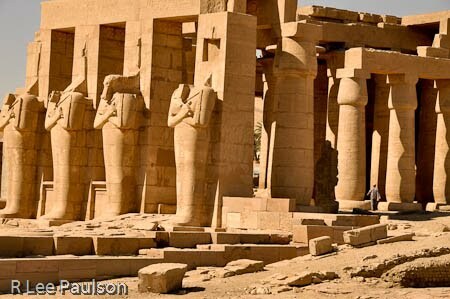 The Ramesseum is a mortuary temple of Ramesses the great, made famous by the huge, fallen colossus. Here, the Eight Primordials, shadowy entities, as West calls them, that precede manifestation are honored. I mentioned before that parallels have been found between the Eight Primordials and the particles/forces involved in modern particle physics and string theory that bring matter into manifestation. It has been suggested that by anthropomorphizing these particles/forces, the ancients were attempting, through religion, to teach scientific principles--or keep them alive. West believes this is true, but the argument will rage on into the indefinite future. 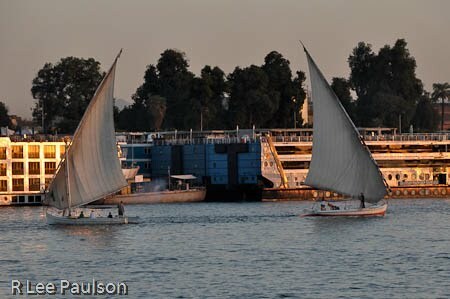 I think I've mentioned that while in Luxor we were treated to a unique opportunity. Because our group was so small and because Muhammad, of Quest Travel in Egypt, had a vacancy that week on his sailboat, we were invited to stay on the sailboat, instead of in a hotel. 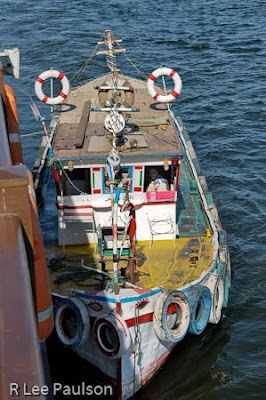 But, we got to float around a lot first and see more than I can ever show here. Last time, I showed images of towns, villages and fields. 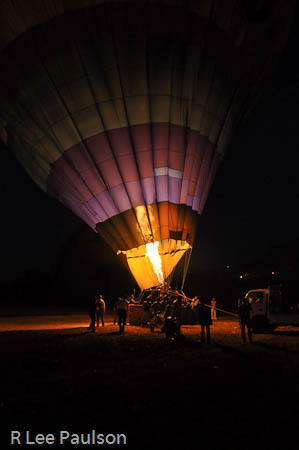 So, we were headed out of town in our van early in the morning on our way to Abydos when I spotted some hot air balloons across the river. I casually pointed them out to the rest of the group because I thought they would enjoy seeing how serenely the balloons and their passengers were floating over the Nile valley. To my surprise, Mike got all excited and demanded that Mohammed, our local tour guide for Luxor, find out how much it would cost for us to go for a ride. 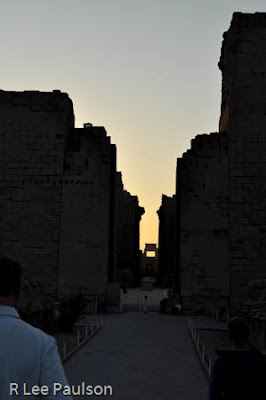 As part of the new year's celebration, the statue of Hathor was carried, in the dark before dawn, up the stairs (shown in the last post) from the main floor to the temple roof. In his book, West says the spiral stairs represent stages or hours of the night. On the trip, he said the stairs could also be symbolic of cycles of life and the fact that even though we cycle around to a new year, we are never in the same experiential place twice. The temple itself lies inside this huge mud brick wall behind what remains of the original gate. 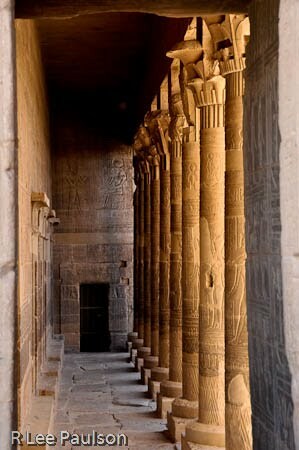 By the time we reached Dendera, I was on overload. We had been up late the previous evening visiting the Temple at Luxor, then up early and spent our morning at Abydos. 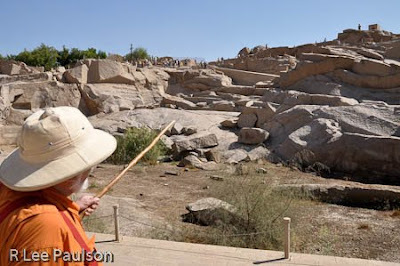 West had spent much of our time driving in the van giving us a historical overview of ancient Egypt along with the basics about some of the mythology that I have been sharing. When our van pulled up in front of Dendera that afternoon, the pressure inside my brain of attempting to absorb so much information so fast was becoming acute.